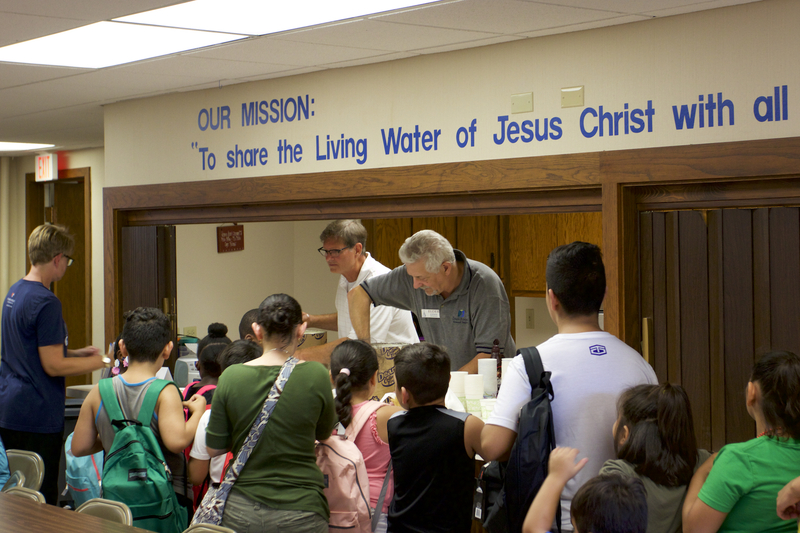 Community Outreach consists of activities Bethlehem carries out primarily to meet needs of our local and worldwide community that also serve the purposes of our church. 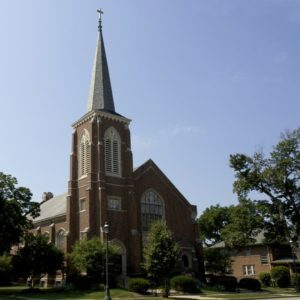 There is a great deal of overlap, but Community Outreach activities are ministries that are directed outward as opposed to being directed inward toward our congregation, such as fellowship, Christian education and helping members in need. If you desire to view any of the photographs contained on this page in full screen mode simply click on the photograph. 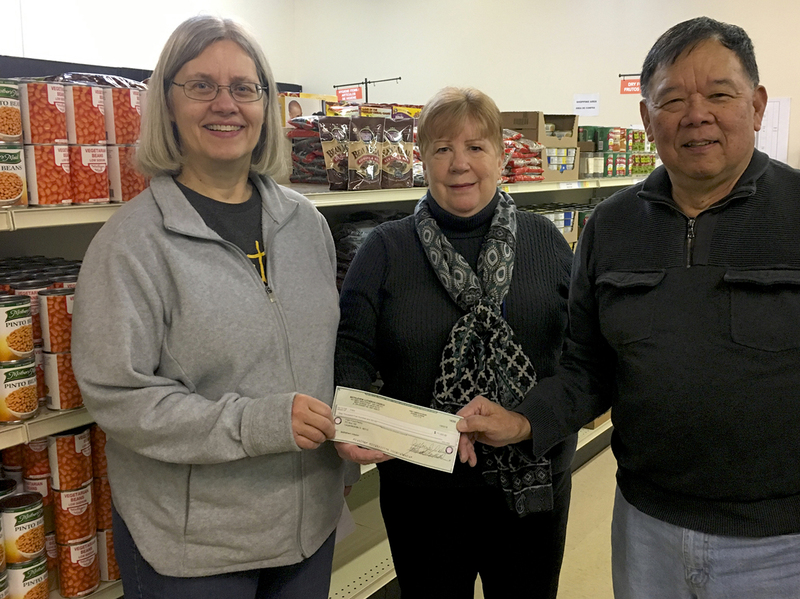 Jesus said, “When I was hungry, you gave me something to eat.” At Bethlehem we seek to serve the community by offering a Food Pantry. 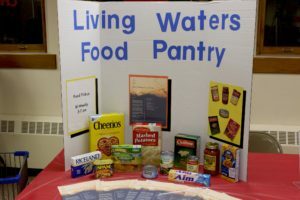 The “Living Waters” Food Pantry is open every other Wednesday evening from 5:00 p.m. to 7:00 p.m. No qualifications need to be met by our patrons. All are welcome. This ministry strives to identify ways we can help members of the community. They have helped countless people in need through donations to their Mission of the Month and have recently included collections for the F.I.S.H. (Friend I Shall Help) Food Pantry and collecting Christmas gifts for AID which empowers and provides special services for individuals with disabilities, mental illness and more. Please contact the Church Office if you want to help out with H.I.S. 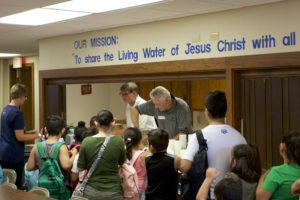 Ministry and Mission. Free backpacks and school supplies are distributed to students on a first-come, first-serve basis. Students and their families also enjoy refreshments and activities. This special team of people have a heart for sharing the Gospel of Jesus with other people. Once a month this small team of passionate believers go out to public places (e.g. the mall, fast food restaurants) with the intention of finding someone with whom to share the fact that salvation is a free gift through faith in Jesus. 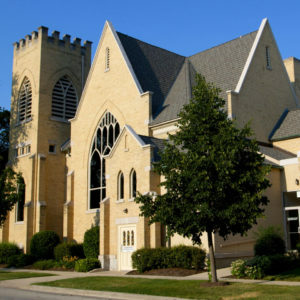 Conducts fundraising projects such as the Spring In Rummage Sale and the Dickens Soup and Sandwich Luncheon and Bake Sale that contribute to worthwhile causes such as the FISH (Friend I Shall Help) Food Pantry, and many others. The Guild also sponsors fun activities such as White Elephant Bingo. The photo shows Martha Lehman presenting a sizable check to officials of the F.I.S.H. Food Pantry. 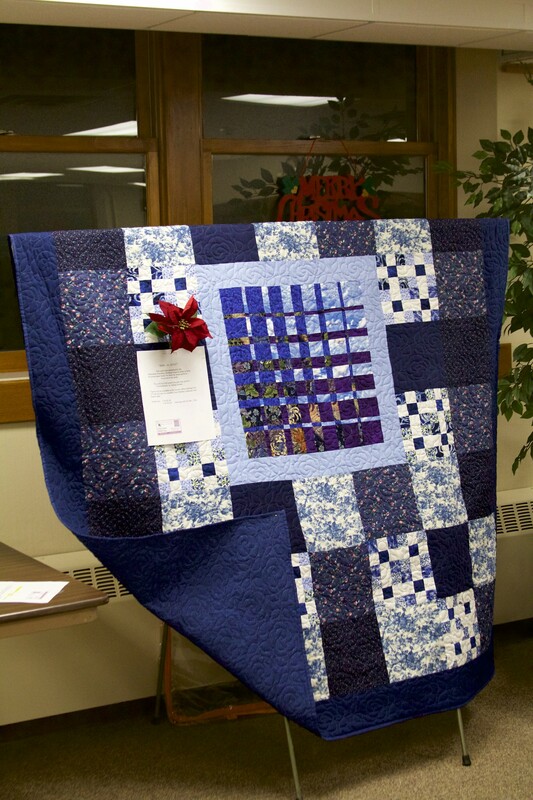 Make about 200 custom quilts a year for those in need. 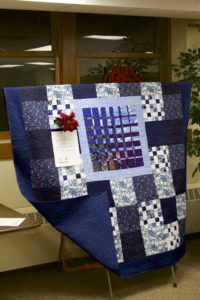 Quilts are provided to Lutheran World Relief, veterans and their families, and victims of natural disasters. This class is led by American Council of Exercise Certified Fitness Instructor Linda Bryant two or three times a week. Mature adults achieve overall wellness by learning about healthy lifestyle choices. Men and women of any age that want to get moving and have fun refresh and enhance their vitality and inner-health. The Pilates based workout benefits include muscle strengthening and stretching to develop the body’s core, mobilizing the spine, and building agility, flexibility, balance and coordination, thus improving their internal and external body. Chair used for stability and all activities are chair or standing based. On February 15, 2019 the boys turned eight months old! Each of the pups has started to really show its own individual personality. Luke is a ham and insists on being called “Handsome Luke.” He really loves children and will often get close to investigate. Noah is shy, sweet, and reserved. Although he is the largest of the pack, he is also the most cautious. Titan is the most rambunctious. He has enough energy to fuel a small town! We have also found that he is a trickster who enjoys hiding shoes, car keys, and just about anything he can grab and bring to his treasure trove. Hero is the runt and also the leader of the pack. Even though he is small, he has the heart of a Lion! He has developed the habit of standing on 2 legs and leaning on the counter so he can communicate with people. All of the boys show high intelligence and learn their commands very quickly. The boys have been busy with their training and have almost completed puppy primary training! They are learning both voice commands and hand signals. Once this “basic training” is complete, they will be spending four days a week at a training facility in Indiana. Their first project will be working with the Wounded Warrior organization. Starting Spring 2019, the boys will be making trips to the airport to Welcome Home our returning heroes and also visiting the Veterans hospitals. We have fitted them with military harnesses that they will wear while working with the soldiers. They will wear special patches that include our Bethlehem Church logo and the line “Soldier of God”. Most of this Summer, they will be doing community outings to raise money for the Wounded Warrior organization and the families of soldiers abroad. Within the next few weeks, they will start dropping in at Worship Services, alternating the pups so everyone has a chance to visit. This is part of their service training. When they come, they will be positioned at the back of the Sanctuary for anyone who would like to say hello. 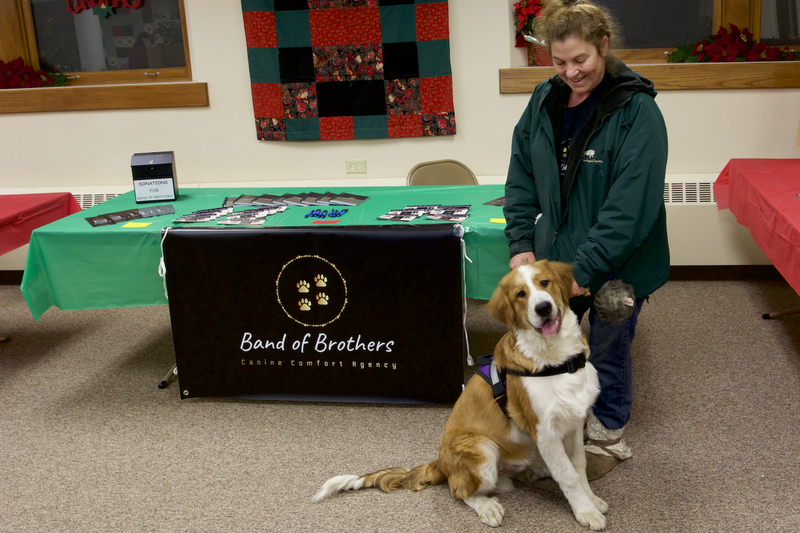 The unique, calming nature of comfort dogs are a bridge for compassionate ministry, opening doors for conversation about faith and creating opportunities to share the good news of Jesus Christ. Sisterhood of Stitchers Serving Our Savior S.O.S. S.O.S. is a group of ladies who have been blessed with the gift of knowing how to knit, crochet and also sew. Our mission is to provide items of comfort to those in need and surround them with warmth and caring in the name of Jesus, our Savior. Beautiful afghans are crocheted by a friend of our group and are given to the senior care home, military hospitals and others in need both in our community and other places in our country. Washcloths are knitted and supplied to our Sunday School children who place them with other treasures in their “Operation Christmas Child” shoeboxes which are sent to far-off countries around the world. Prayer shawls are knit to give comfort to those who are suffering numerous difficulties in their lives both in our congregation and wherever we hear of a need. 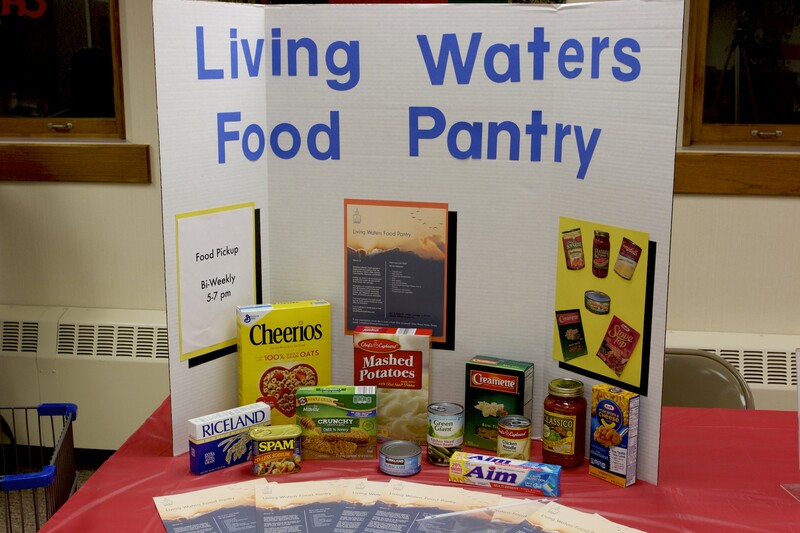 Scarves, hats and mittens/ gloves are given to those in need of their warmth in our Bethlehem “Living Waters” Food Pantry, F.I.S.H. Food Pantry, and the Association for Individual Development (AID). Baby hats and afghans — knitted, crocheted, and sewed — are given to St. Alexius Hospital in their special care nursery for the tiny babies who have many medical issues. Also, aromatherapy hearts are being sewed for the preemies in that nursery. Most of the materials used in this mission are donated, but are also sponsored with funds made available to us from our Women’s Guild. Bethlehem provides a pop-up bible school at Grafelman Park during West Dundee’s annual Heritage Fest celebration. 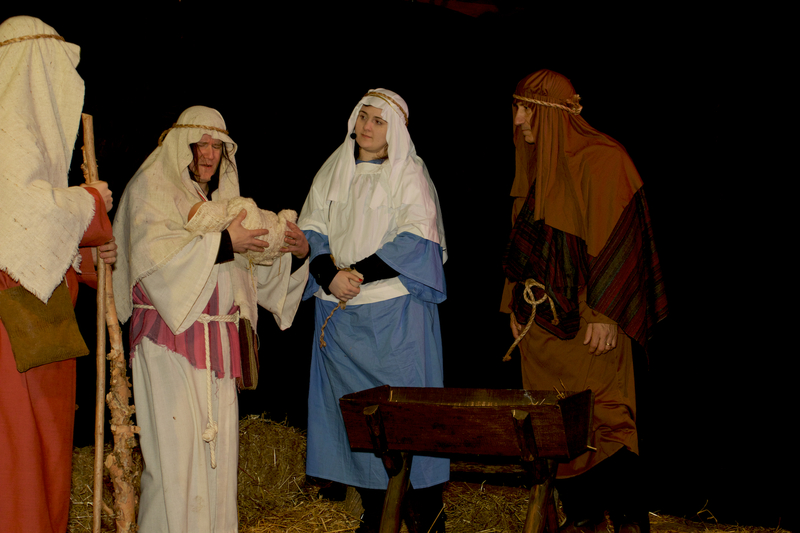 Live playlets are performed about the birth of Christ and craft projects are provided for children. People can enjoy a pleasant luncheon and support our community following the Dickens’ Christmas Parade. Every penny taken in is donated to the F.I.S.H. Food pantry. 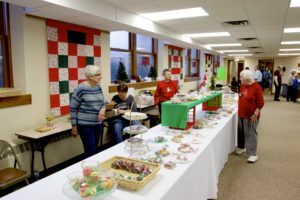 The food being served is funded by proceeds of the Dickens’ Bake Sale held the same day and by donations from Thrivent and a local business which also provides help for the event. 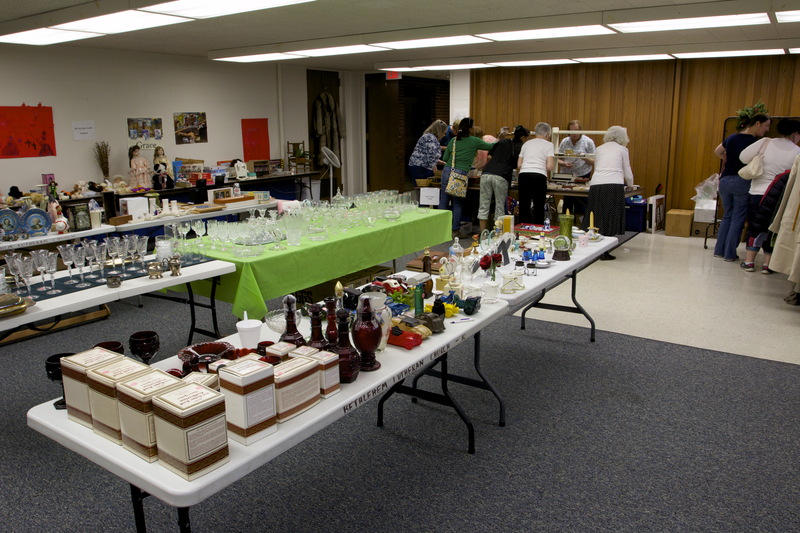 This is more than just your run-of-the-mill rummage sale, it is a community event. 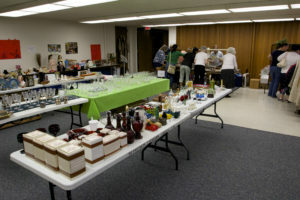 This is one of the biggest and best rummage sales in the area. Everything is laid out in an orderly fashion. 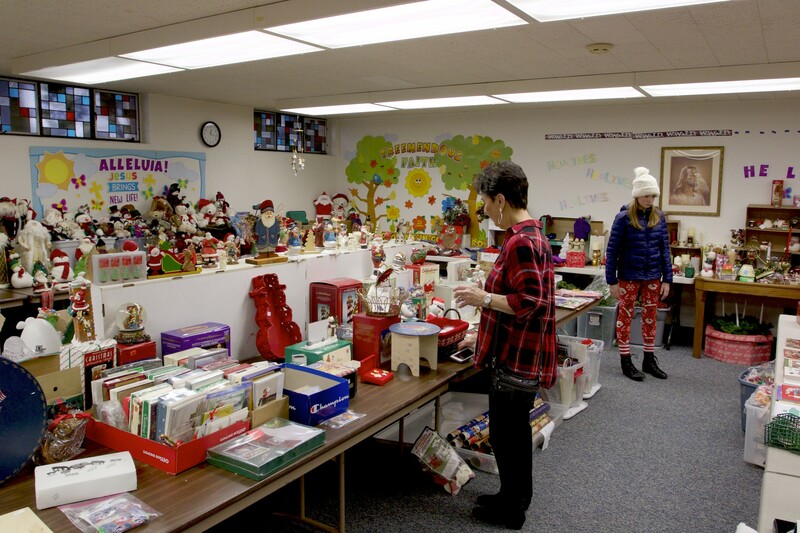 The neighborhood not only shops at this rummage sale but they look forward to to visiting with others who attend this event year after year for decades. There are three areas to shop. The big room has everything including toys, clothes, dishes, shoes, hats, handbags, and other things too numerous to mention. The upscale room has jewelry, paintings, antiques, collectibles and specialty items. In the garage you will find lounge chairs, desks, beds, sleds, fishing gear, tools and all that house and manly stuff. On Saturday there is the customary bag sale. Singers from the congregation accompanied by our organists and pianists perform at special events like the Christmas Concert and at selected worship services, especially at our Traditional worship services. 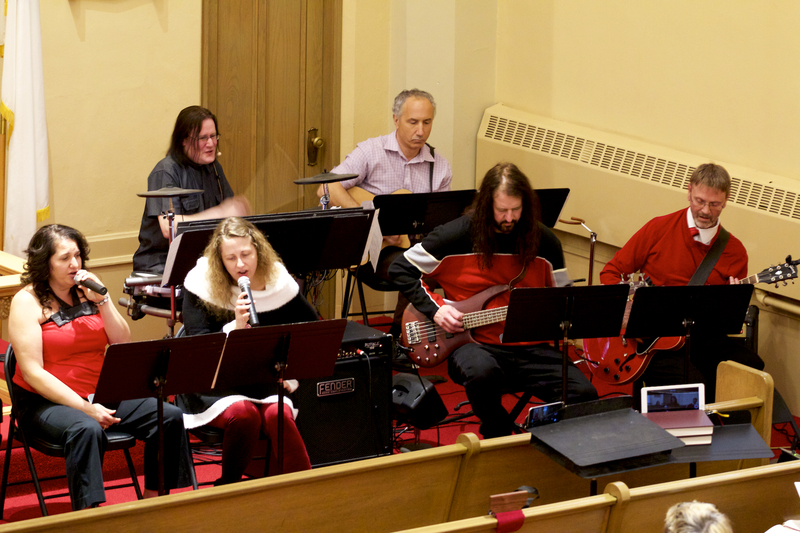 The congregation at our Contemporary worship service sings along as the band and singers perform Contemporary Christian Music live on stage and at special events such as the Memorial Day parade. The band includes instruments such as guitars, drums, and keyboard. 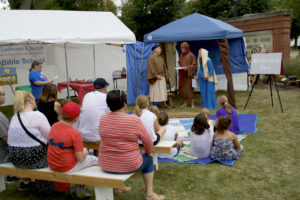 This free event includes guided 30 minute outdoor walking tours of live acting scenes with a spiritual and social message: Christ lived and died for our sins. Watching Bethlehem Christmas Live! bring to life events before, during and and after the birth of Christ gives viewers of all ages a positive spirit through the holiday season. The tours are followed by indoor family activities like crafts and cookie decorating with refreshments and a special visit with Santa Claus. 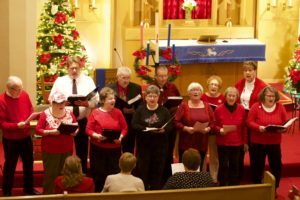 The public is invited to our annual Christmas Concert followed by a social time with light refreshments. 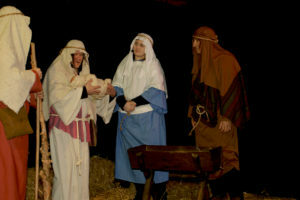 Music and songs are performed by the Bethlehem Choir, The Messengers Praise Band and Singers and by the Sunday School children. 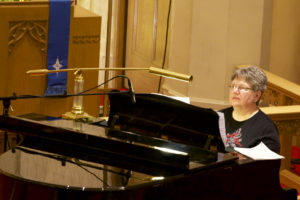 Everyone is invited to sing along with traditional Christmas carols. Examples include the hosting of Cherished Place of Dundee adult day care, The Children’s House Montessori School, Alcoholics Anonymous and Dundee Township Historical Society Dickens’ of a Sale. Other community-minded groups are encouraged to use our facilities as well. Rental fees may apply.